Anatoly Filatov takes down partypoker's MILLIONS Russia for $886,000. After more than five full days of action, the final table of partypoker LIVE’s MILLIONS Russia Main Event came to a conclusion on Monday. Over 650 runners packed the Sochi Casino and Resort over the course of three starting flights, all looking for their share of the 300,000,000 RUB ($4.4 million USD) guaranteed prize pool. 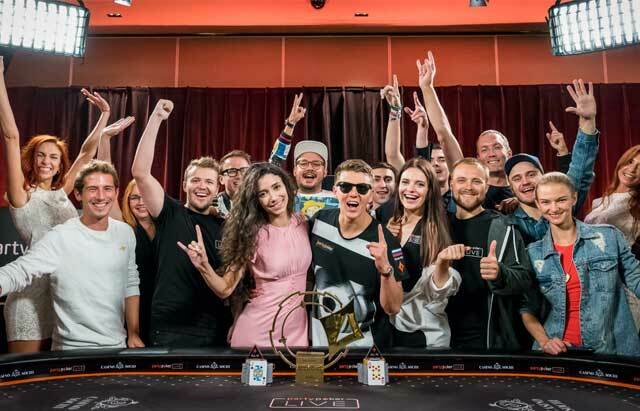 In the end, it would be partypoker’s own ambassador, Russia’s Anatoly Filatov, who ended up on top taking home the 60,000,000 RUB ($886,200 USD) first place prize. When the official final table got underway, seven of the eight participants all hailed from the Russian Federation. Chip leader Viktor Khodorenko, from Belarus, was hoping to dash the hometown dreams of his fellow final tablets. It only took 11 hands into the official final table for the first player to fall. Short-stacked Konstantin Uspenskii found a spot to four-bet all in holding . Having already three bet his , Filatov called and even though dominated, Filatov spiked a turn to secure the hand and sending Uspenskii to the rail in eighth place for 4,200,000 RUB ($62,142 USD). Filatov was just getting started getting to work. An hour later he found himself once again in position to knock out a player when Mikhail Galitskiy moved in on Filatov’s opening raise. A quick call from Filatov, who held , saw he was up against Galitskiy’s . The board offered some excitement as it ran out but pocket kings held ending Galitskiy’s Main Event run in seventh. He took home 6,000,000 ($88,749 USD) RUB for his efforts. Gleb Tremzin found himself super short and moved in under the gun holding and, unfortunately for him, he was called in two spots by players both holding bigger pocket pairs. Andrey Malyshev called with while chip leader Khodorenko tried for the double knockout and called with . Despite a small side pot brewing, the board ran out clean for pocket tens. While Khordorenko took a hit to his chip, Tremzin took a trip to the rail finishing in sixth for 8,400,000 RUB ($124,172 USD). A few hands later Filatov officially took over the chip lead for the first time at the final table, one that he would widen with his elimination of Alexey Melnikov. Melnikov moved his short stack all in from the small blind holding and Filatov made the easy call with . Melnikov held the lead in the hand all the way until the river when the gave Filatov the only pair and the knockout. Melnikov goes broke in fifth place for 12,000,000 ($177,386 USD). His previous best live cash in his career was for roughly $10,000 USD. Roughly an hour and a half later, after some wild swings in which the chip lead was wrestled from Filatov and one-time chip leader Khodorenko lost the bulk of his stack, another player busted. After an open from Gor Kazaryan, now short-stacked Khodorenko made his last stand shipping his stack with . Once again it was Filatov in the middle of the action as he re-shipped from the big blind holding . Kazaryan got out of the way and Filatov spiked a set on the turn, making the river useless for Khodorenko. Khodorenko wraps up his tournament in fourth place for 18,000,000 RUB ($266,139 USD). The final three players would battle through a dinner break and a swing of chips that saw each of them assume the chip lead at one point. With both Malyshev and Filatov looking up at Kazaryan in the chip counts, they battled each other for the right to go heads up against the chip leader. Malyshev shoved with ten big blinds. Filatov in the big blind ended up making the call with , out-pipping Malyshev by one. The board ran out making it so the eight plays. Filatov claimed another victim and Malyshev claimed his third place prize of 26,730,000 RUB ($395,066 USD). It took 58 hands of heads-up play to determine a winner. Though Kazaryan started the match with the lead, the chip swings were many and eventually, Filatov wrestled away not just the lead, but the tournament. On the final hand of the contest, Kazaryan limped with . Filatov raised his . Kazaryan called. The flop was dealt . Filatov was open-ended and Kazaryan flopped two pair. Kazaryan took the betting lead and Filatov called. The came on the turn giving Filatov the straight, which he checked. Kazaryan continued to bet. Filatov shipped, Kazaryan called off and when the hit the river, the Main Event was over. Filatov had eliminted six of his seven final table opponents en route to victory. Kazaryan collected a healthy runner-up payday of 39,000,000 RUB ($576,543 USD) while the ambassador Filatov earns a new career-high score of 60,000,000 RUB ($886,200 USD).